The Palestinian Centre For Human Rights (PCHR): Israeli gunboats chased and opened fire at Palestinian fishing boats. They then abducted two fishermen and seized a fishing boat. This is part of the Israeli ongoing attacks against Palestinian fishermen and preventing them from sailing and fishing freely and accessing the fish-breeding areas in Gaza Sea. According to PCHR’s investigations, at approximately 13:30 on Thursday, 10 January 2019, Israeli gunboats stationed off Beit Lahia Shore opened fire at Palestinain Fishing boats sailing in the sea. 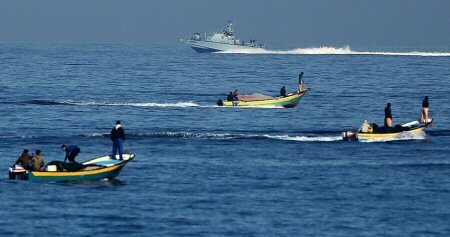 The Israeli gunboats then surrounded a fishing boat sailing within 3 nautical miles. The fishing boat belongs to Khaled Mohamed Meqdad and was manned by Mohamed Mahmoud Ishkontana (22) and his brother, Mahmoud (21), who are both from al-Shati’ refugee camp in Gaza City. The Israeli naval soldiers then ordered the fishermen to take off their clothes, jump into the water and swain towards the gunboat. They were arrested in addition to detaining the fishing boat. At approximately 19:00 on the same day, the Israeli authorities released the two fishermen after interrogating them while the boat is so far under custody.